The so called "Growing Season" has just started in Northern part of the United States. Being a short season (Typically the growing season here ends in August end), the seeds are started indoors during late winter and saplings are planted. 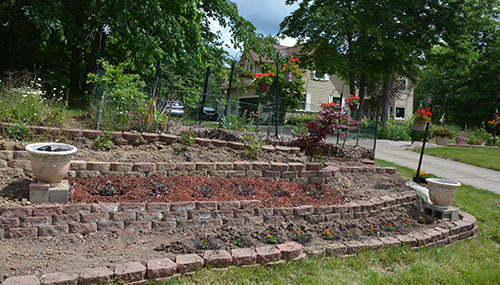 In Gardens such as this in Hudson Ohio, the soil is generally prepared in advance and all the weeds are removed. So, how the plants will grow depends mostly on how the garden is tended during the summer months than the Sower in ancient Palestine would have encountered. Reflecting on the bible passage this week, it occurs to me that the condition of the gardening process in North Coast vs. the planting in Palestine in Jesus' time provide us a glimpse of the condition of the church in the respective period too. A curbside evangelism may resemble the Parable of the Soils given by Jesus. Well organized Gospel conventions held these days will resemble the garden preparation in America's North Coast. 6. What is the meaning of the Parable of the Sower? 14. Self Improvement: Are you Busy or a Busybody? 15. Is Happiness Around the Corner?